Looking your best means making sure that you have everything about your appearance in order. The way you dress yourself, style your hair, and apply makeup can present a more or less positive image of yourself. To help you always look your best, cheek reduction surgery can minimize prominent cheekbones to make your face more beautifully balanced and attractive. Many patients undergo cheek augmentation to improve cheekbone definition and facial balance. Others, on the other hand, often have the opposite concern. Often, patients wish to reduce cheek prominence and even out their cheeks. This is especially common for patients who have a narrow face with wide cheeks. 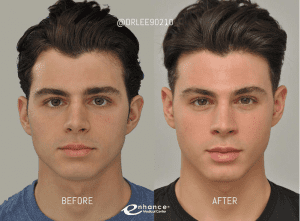 Dr. Lee can perform cheek reduction for these patients to help them restore balance to their natural facial structure. If you feel that your cheeks look unnaturally wide or if you feel that they do not help you look your best, a consultation with Dr. Lee will reveal whether cheek reduction surgery is right for you. Cheek reduction surgery can improve the balance of the face so that it looks more attractive and natural. To perform the procedure, Dr. Lee makes an incision either inside the lip or behind the hairline. He then shaves the cheekbone or pushes it inward to improve facial balance and minimize prominent cheekbones. Often, Dr. Lee will perform buccal (cheek) fat removal to minimize the cheeks in addition to or instead of manipulating the cheekbones. The results of cheek reduction are permanent and natural looking. Dr. Charles Lee is a renowned Asian cosmetic surgery specialist. In addition to cheek reduction, Dr. Lee offers specialized procedures such as Asian rhinoplasty and Asian double eyelid surgery to help Asian patients achieve their aesthetic goals. Dr. Lee understands the complexities of the Asian face and can help you determine which procedure(s) you should consider to improve your appearance. To learn more about cheek reduction or other Asian cosmetic procedures, request your personal consultation with board-certified plastic surgeon Dr. Charles Lee. Call (310) 231-6811 or schedule a consultation online with us today.